Though it is still February and many of us are engrossed in the winter Olympics watching althetes perform in the snow and ice, I've had about enough of winter. We are expecting more snow on Tuesday. With March in a couple of weeks, though, I'm thinking spring! 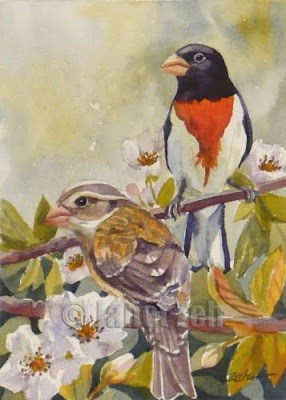 So, here I've painted a couple of beautiful grosbeaks that visit my yard in a blossoming apple tree. When I finished the painting, I noticed how camouflaged the female bird is, just the way nature intended. The original has been sold, but check for more of my bird art in my Etsy shop, JanetZeh.Etsy.com. Thanks and have a beautiful day!